The demonetisation move may have been announced to herald the cashless era – indeed, the volume of electronic transactions increased 43 per cent from November to December 2016, as per Reserve Bank of India data – but the effect is already wearing off. From December 2016 to February 2017, the volume of electronic transactions had reduced by 20 per cent, and the downward trend seems to be continuing in March 2017 too. A multitude of factors seem to be contributing to this return to cash: surveys on Mobile Vaani highlight a lack of knowledge about cashless payments among potential users, lack of technology and infrastructure required to go cashless and a general lack of readiness. Other issues include the lack of merchant acceptance, frequently running out of balance and the fear of – or occurrence of – errors with payment. Indeed, one-off, sharply focussed events such as demonetisation are not sufficient to transform India’s payment landscape. Neither will a blanket approach to digital payments work, where one expects the environment will simply prompt increase in usage and acceptance of cashless payments. Similar initiatives aimed at bringing users online, such as Airtel’s zero-rated services, Facebook’s Free Basics or the recent free data from Reliance Jio, haven’t worked, with research showing that the users who used these services were already online, not first-time users. With our own experience and hard work of mobilizing non-technology users to using our Mobile Vaani service in rural Jharkhand, Bihar, and Madhya Pradesh, we recognize that an on/off switch targeting one aspect of behaviour is not sufficient for sustained change. Blanket approaches do not work, and a more nuanced and integrated approach is needed to drive technology adoption. In this blog, the first in the Mobile Vaani 2.0 innovation campaign series, we explain how going value-chain by value-chain to incorporate Information Communication Technologies (ICTs) and digital financial services, should be the way to go to create this transformation in a step-by-step gradual manner and not through disruptions. Let’s see how going cashless and incorporating ICTs in livelihood value chains will affect the life of Heera, who lives in a village in Madhya Pradesh. Heera is part of a Self Help Group (SHG) into which she has been depositing cash every month for a few years now. Last year, she borrowed money from the SHG pool to buy a few goats. She’s been rearing these goats, feeding them and milking them and hopes that she can sell them off to another trader or a butcher in the coming months. When any of the goats needs medical attention, she goes to the local vet. All her transactions – her payments to the vet, to the person she buys feed from, the money she might collect from the goat trader or the vendor – are in cash. What are the issues with this value chain? First, a huge reliance on cash outside the formal banking system, means data for assessing Heera’s credit worthiness is next-to-absent. This means her transactions with the butcher, the trader or the vet are all reliant on her own directly available supply of cash. She cannot access loans from banks or microfinance institutions (MFIs) easily, disrupting her ability to transact within her value chain in the case of emergencies or if rapid scaling opportunities present themselves. Second, Heera’s decisions are mostly based on hearsay and her judgment. She goes to the only vet, trader or butcher she knows, and her rates of selling the goat are based on word-of-mouth information about current rates. With greater access to market information she may be able to leverage the right linkages and run a more profitable business. Third, advice and feedback on managing her business is hard to come by because the ability of SHG promoting institutions (SHPIs) and MFIs to engage closely with their borrowers is limited by the time available with their staff and mentors to understand and interact with their borrowers. These weak links disrupt the value chain easily, affecting every party in the chain, ranging from the SHPI itself to the vet to the trader to the butcher to the shopkeeper who finally stocks the meat. Heera represents a group of people who hold the most potential to encourage the spread of cashless payments in India – SHGs and Farmer Producer Organisations (FPOs). India’s current idea of going cashless has been through a blanket approach, in the hope that enough number of people use and accept cashless payments for digital financial transactions to become the mainstay. However, this one-size-fits-all approach waiting for a critical mass is not going to work that easily – as it is, with currency circulation levels inching closer to that in pre-demonetisation times, the incentive to go cashless has been going down. Additionally, rural India hardly got on to the cashless bandwagon, for reasons ranging from illiteracy to lack of knowledge about going cashless, lack of products and acceptance points for cashless payments. However, the opportunity remains – to integrate digital payments in the lives of rural India. Gram Vaani and Onion Dev believe that adding Information Communication Technologies (ICTs) has the potential to not only drive cashless payments but accelerate efficient market linkages and information availability. How does Heera benefit from this ICT-enhanced value chain? She can access information about health, sanitation, government schemes, etc. Technology integration will enable the SHPI to also closely track Heera’s life and problems she is facing, and guide her on running her business. Interactions with the vet, mentors, and other stakeholders can be more speedy and efficient. How will this roll out? SHG (or FPO) members such as Heera, their partners across the value chain – related buyers and sellers, medical service providers, credit providers, insurance networks, etc. – will be linked together using wallets for cashless transactions. The key is to bring all relevant stakeholders on to the common platform in one go, so that cash enters or leaves the value chain only at end-points. 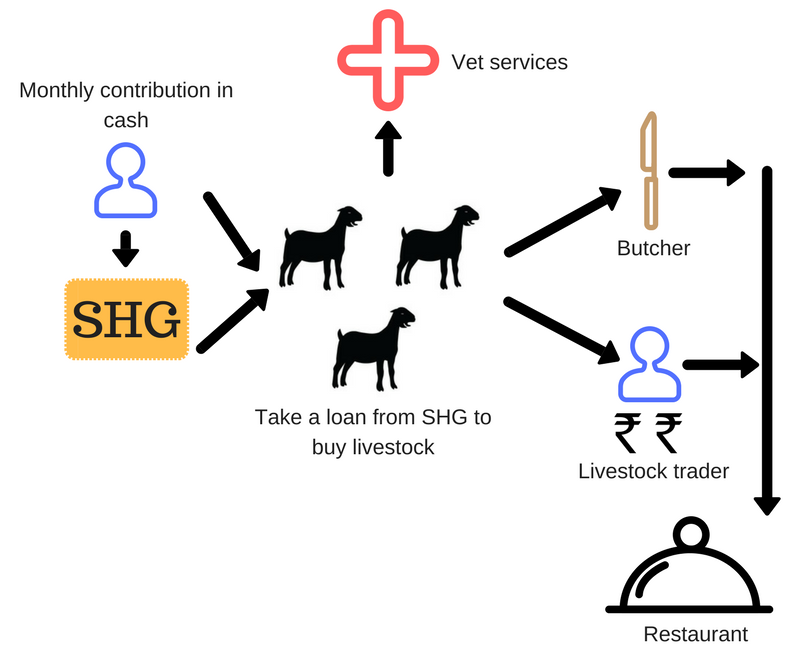 Service providers such as vets and hospitals, feed providers, etc., will be linked through partnerships with SHGs, so that both players get benefits from readily available clients/service providers. More efficient information flow will help solve problems quickly and comprehensively. Information on prices, loan rates, government schemes, etc., will be provided through IVR. The same IVR can also be used to deliver social messaging information related to health, sanitation, agriculture, education, etc. This will not only improve convergence between different government schemes and drive demand, but also reduce information asymmetry to create more efficiently operating local markets. Starting with a pilot of SHGs or FPOs in one area, the project can be eventually scaled up. How can you partner us? Are you a credit institution, a payments organisation, an NGO that works in the areas of digital finance or financial inclusion? You can support this experiment for validation through a pilot. 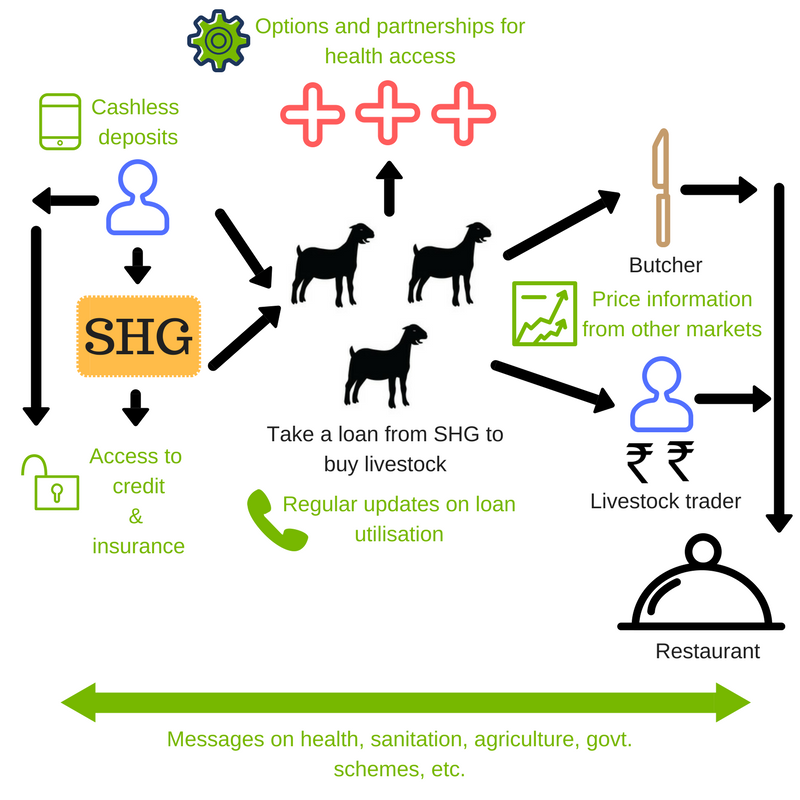 Are you a an SHG promoting institution or FPO that is deeply integrated into local livelihood value chains? You can partner with us to co-create this solution and demonstrate the operations for eventual scale-up. Write to us at contact@gramvaani.org or call us on 011-6940 0445 for a detailed presentation on how we could work together!